After a long winter without escapes to warmer climates, the boys made two trips south in April 2010: first to Havana, Cuba and then to Playa del Carmen, Mexico. These were their first trips to both of those countries. "Are you going to eat that?" 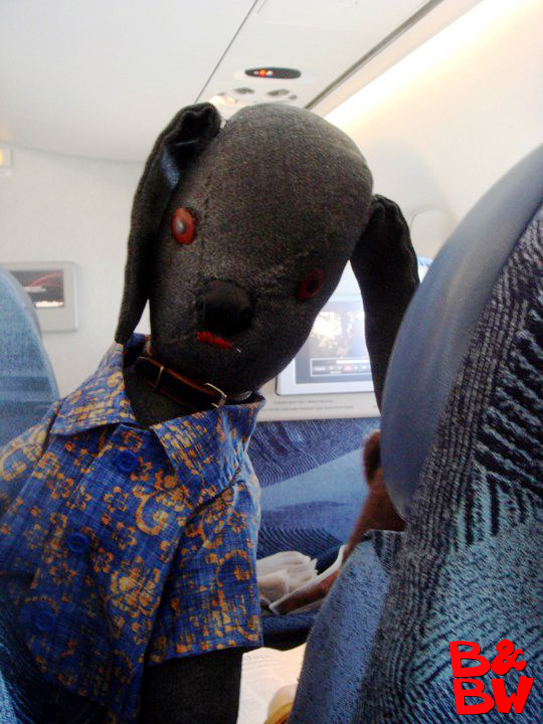 Bow Wow turns around to have a quick chat with his friends in the row behind on the flight to Havana. The boys took a stroll through Old Havana. Move the mouse over the photo for a different shot. Walking through Old Havana, the boys stumbled upon el Floridita, an establishment famous for its daiquiris and for having being one of the favourite hangouts of Ernest Hemingway. So, of course they stopped in to pose with a statue of the famous author and a couple of lime daiquiris. The boys stop for a photo op in front of a statue of José Martí, a Cuban national hero and an important figure in Latin American literature. After all the daiquiris at el Floridita, a sobering stroll along el Malecón was in order. Move the mouse over the photo for a different shot. Revolutionary propaganda was every where in Havana. Bow Wow found it ironic that the episode of Mad Men he watched on the flight home from Havana was the one set during the Cuban missile crisis. A few weeks after their return from Havana, the boys were on their way to Mexico for a few days of R and R in Playa del Carmen. Bear quickly adapted to the pace of the resort, by adopting the Mexican tradition of the afternoon siesta. 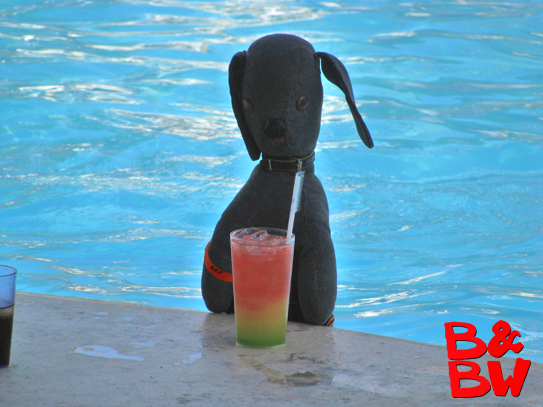 Bow Wow, on the other hand, was more enamoured of the tradition of the swim up bar. Too bad that the orange bracelet didn't entitle him to free drinks at home in Toronto. Post-siesta an iced-coffee at the hot new cafe was in order to allow Bear to wake up and Bow Wow to sober up.